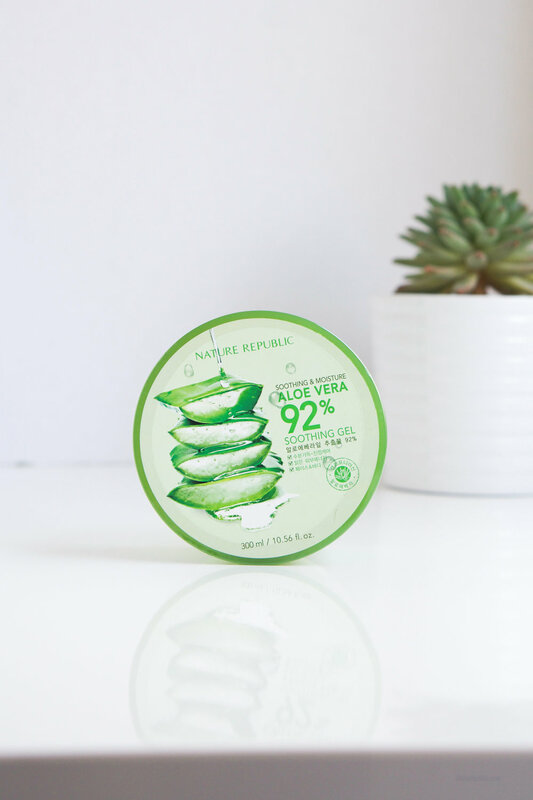 Nature Republic’s Aloe Vera Soothing Gel is made up of 92% organic aloe vera leaf extract. It helps moisturize, soothe, refresh, and firm the skin. Aside from being a skin moisturizer, it can be used as a sleeping pack, body moisturizer, hair treatment, eye and lip treatment, after-shave, and more! You can get this in a 300ml tub or 250ml tube. I purchased mine in a 4 pack at Lotte Duty Free and each tub cost me less than $3! If you can't get to Duty Free then I've linked some other options below. The Cactus Soothing Gel is made with 92% cactus water collected from Eastern Prickly Pear grown in Pyeongchang, Gangwon-do. It works just like the Aloe Gel version and is also multi-purpose. It comes in a 250ml tube and price can range from $5-$14 depending on where you get it. I got mine for $5 at Lotte Duty Free. It’s currently out of stock on the Style Korean website, but I’ve linked it anyway in case it comes back. Aloe Barbadensis leaf extract (92%), alchol, glyceryl polyacrylate, dipropylene glycol, butylene glycol, glycerin, propylene glycol, 1,2-hexanediol, polyglutamic acid, betaine, Sodium hyaluronate, calendula officinalis flower extract, spearmint extract, Melissa officinalis extract, carbomer, peg-60 hydrogenated castor oil, triethanolamine, phenoxyethanol, water, parfum, disodium EDTA. The star ingredient is obviously aloe vera! Aloe has antioxidant, antibacterial, and anti-inflammatory properties. It’s great for treating dermatitis, healing wounds, rashes, acne, and other skin ailments. Looking at the rest of the list, no significantly harmful ingredients found. Prickly Pear Extract or Opuntia Humifusa Flower/Stem Extract is an anti-aging, anti-inflammatory, skin smoothing ingredient. It hydrates, calms, and brightens the skin! The only negative ingredient is Alcohol Denat. While it helps to make products absorb quickly without leaving any residue, this is actually very drying for the skin. It leads to poor skin condition and weakened skin barrier. Even if you have oily skin, you want to stay away from Alcohol Denat. The last thing I don’t like is all the coloring agents- it just seems so unnatural. Looking at both these ingredient lists, I’m sure you’ll agree with me that if you can get your hands on the real thing then use the real thing instead! But if you can’t, then the Aloe Gel is definitely better than the Cactus Gel. Let’s talk first about similarities. Both are refreshing, lightweight, cooling, and are wonderful to use as moisturizers in hot weather. They absorb into the skin quickly with zero residue. If they’re not moisturizing enough for your skin, simply add in a few drops of facial oil and you are good to go! Both have fragrances, but the Aloe Gel’s fragrance is very clean and fresh smelling while the Cactus Gel’s fragrance reminds me of sunscreen or baby powder. I’ve used both on the face and body, and prefer the Cactus Gel on the body only. Something about the Cactus Gel’s formulation doesn’t mix well with my other skin care products and makes my skin sting. I also tried it in conjunction with my Klairs Vitamin C Drops, but the morning after effect isn’t as great compared to the Aloe Gel. I’ve never tried Prickly Pear so I can’t compare to the real thing, but I do use pure Aloe Vera! I don't think N.R's Aloe Gel is a perfect substitute, but there are occasions when one works better than the other. For things like sun burns, hair styling, diy masks, or to just use as a simple moisturizer, the gel version is better. For more serious cases like dermatitis, rashes, or wounds then you definitely want to use pure aloe vera instead. If I had to between the two, I would pick the Aloe Gel. It’s so versatile, gentle, and I’m obsessed with how well it works as a mask pack. I recommend N.R’s Aloe Vera Gel to anyone looking for an affordable, effective, lightweight, refreshing, multipurpose, moisturizer.